For picnics, my mother always makes hoagies. The sandwiches vary, but usually it is turkey, provolone, greens, pesto, and some sort of roasted pepper or onion. These simple sandwiches were always fresh and delicious, paired with chips or fruit salad, soda and maybe even dessert. Over the years we’ve eaten these sandwiches up and down the east coast and still they’re my favorite picnic treat, a testament to my mother’s sandwich making skills. 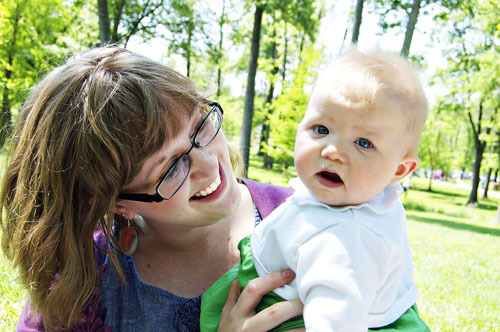 This mother’s day we met the Turcottes at the Wheaton Regional Park for a special picnic. 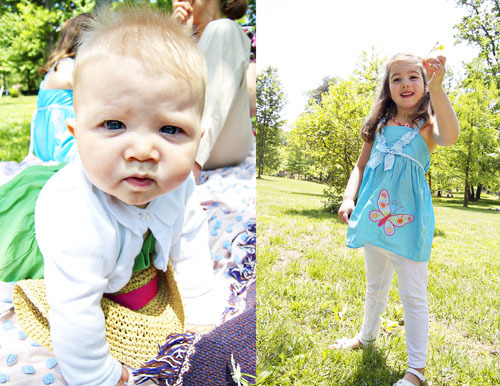 We ate sandwiches, pretzels, pickles, fruit, and whoopie pies and enjoyed what turned out to be a gorgeous day. We took turns making Amelie smile and planned for when Meredith is old enough to read Harry Potter and make the trip to Orlando with her favorite Aunt and Uncle to GO TO HOGWARTS (Meredith has no idea what she’s in for). Dan and I aren’t quite anywhere near ready to have kids (sorry Paps!) of our own so these days we rely on our sweet, wonderful nieces and a group of pretty amazing family friends to keep the little ones in our lives. It was lovely spending mother’s day with the Turcottes, I feel so lucky to have them in my life. Combine all ingredients but roasted red peppers on bread. 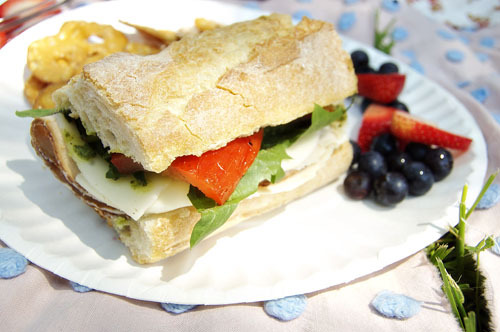 Wrap sandwiches in parchment and pack with peppers in picnic basket. Add peppers when you are ready to eat. Combine 2 cups fresh basil leaves, 1/2 cup olive oil, 1/2 cup grated parmesan, 1/4 cup toasted pine nuts, 3 garlic cloves, and a pinch of salt in a food processor. Blend until smooth.